Make Believe partakes of the nature of the magic ritual. We not only pretend to be what we are not, but by staging our pretense we strive to conjure and bring in to existence a new genuineness. The strange thing is that often this conjuring act succeeds, and we become what we pretend to be. Andrea Rosen Gallery is delighted to present "Between the Worlds," Matthew Ronay's third solo exhibition at the gallery. 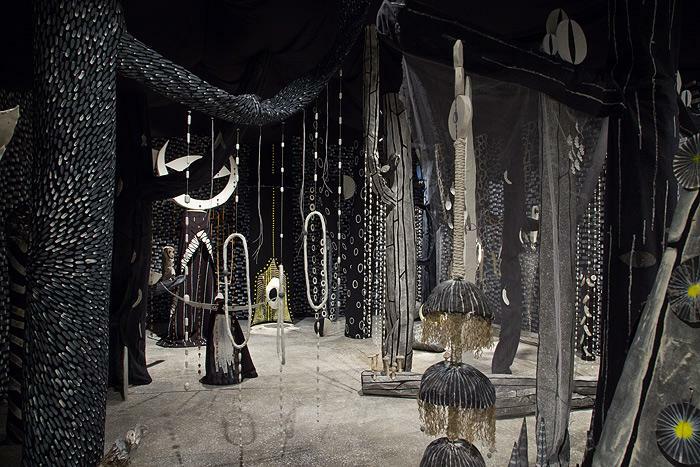 "Between the Worlds" invites visitors to experience a spectacularly immersive primordial forest, a site for transmutation, rites of passage and access to our subconscious primal mythologies. While primitive ceremonial sites were once consecrated in terrestrial environments like caves and forests, or even accessed through use of ritual hallucinogenic agents, over time our ability and even our desire to connect with these spaces has been amputated. Considered irrelevant and subsumed by consumer culture and our current privileging of virtual space, in our adult world we so rarely encounter an environment where intuition and imagination are so directly and genuinely invoked. There is a deliberate and powerful sense of displacement in this world Ronay has created. 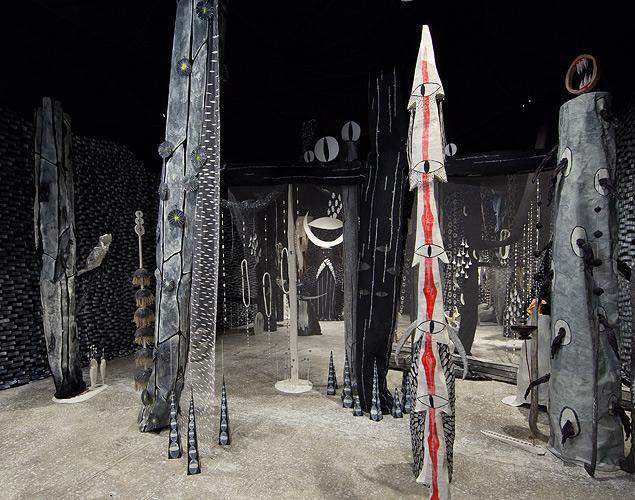 The nebulous black exterior of "Between the Worlds" gives way to a dazzling interior spatial collage; we're uncertain if we have found ourselves in an enchanted forest, an ancient cave or an underwater grotto. By carefully manipulating space, Ronay collapses the traditional distinctions between the terrestrial and the celestial. Masculine and feminine energies are invoked in vertical and cavernous forms, with outcroppings of volcanoes brimming with fertile potential. Perhaps most extraordinary are the polymorphous mystical "beings" which populate the terra. Possessing multiple eyes, or adorned with hand made seed-pods, wooden carved horns and beards, they recall both mythological demons and totemic spirit guides. Remarkably, each element feels both supernatural and somehow deeply familiar. While Ronay's vocabulary is unique, his masterful approach to material and form draws from the profound simplicity of primal shapes and symbols, and their inherent potential for transcendence. Ronay has not only created a site for our own transformative state and projection, but one that is distinctly shaped by his deeply personal process of creation. Finding ritual in the action of repeating simple marks in paint, the rough gesture of papier-mâché, and hand-carving walnut, poplar, cherry and pine, there is not only a fetishization of material but also a subsumption by the materials themselves. The deeply personal and subjective nature of Ronay's work will be mirrored in his performance during the opening. By being enclosed within the large fabric folds of the Masculine Pillar, Ronay is not only willing to place his subjectivity in the public realm through his work, but also willing to risk placing himself into contact with an audience. While there is always the expectation of an artist to put objects out in to the world and to give them a life of their own, Ronay's practice of occupying the works himself reflects a thrilling perverse relationship to notions of "exhibition." The thread of subversive humor and self-awareness present in Ronay's work, although playfully grotesque, is immediately relatable. Joseph Campbell describes the hero's journey or "monomyth" as an act of "venturing forth from the world of common day into a region of supernatural wonder." Drawing from inherited memory and mythologies, Matthew Ronay's "Between the Worlds" invites the viewer to connect with the intrinsic desire for transcendence through the processes of making and the willingness to experience beyond what we know. The first incarnation of Matthew Ronay's "Between the Worlds" appeared at Artpace, in San Antonio, TX, in 2010 and will travel to La Conservera, Ceuit, in Spain in the winter of 2012. 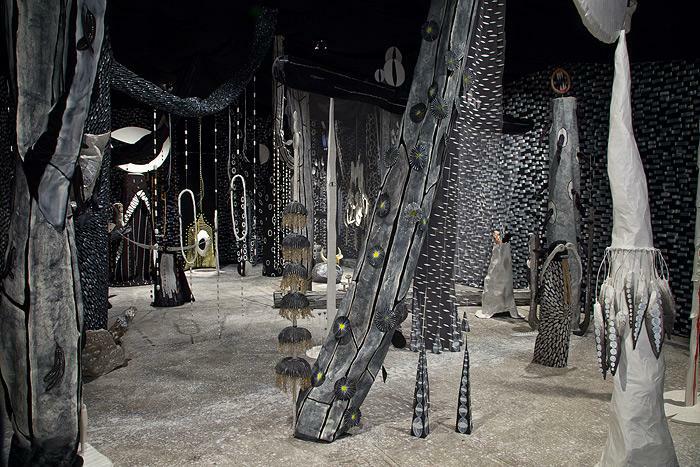 His work will appear in the exhibition "Secret Societies," at the Schirn Kuntshalle, Frankfurt, Germany, from June 22 - September 25, 2011. Ronay presented a celebrated solo exhibition "Goin' Down, Down, Down," at Parasol Unit Foundation for Contemporary Art. 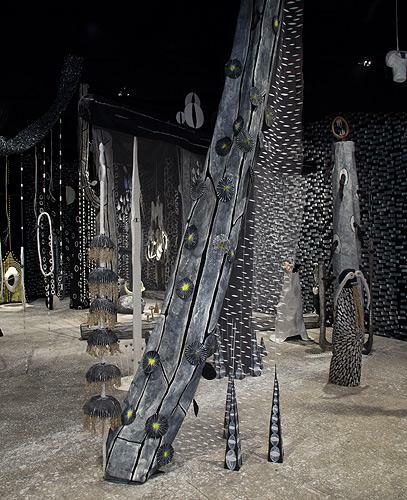 Ronay was recently included with a significant work in the exhibit "Neue Alchemie Kunst der Gegenwart nach Beuys," at the LWL-Landesmuseum, für Kunst und Kulturgeschichte, Germany, 2010. Ronay has also been in notable group exhibitions at the Astrup Fearnley Museum for Modern Art, Oslo; ARoS Aarhus Kunstmuseum, Århus, Denmark; Center for Curatorial Studies, Bard College, Annandale-on-Hudson, New York; Serpentine Gallery, London, England and the 2004 Whitney Biennial, New York. 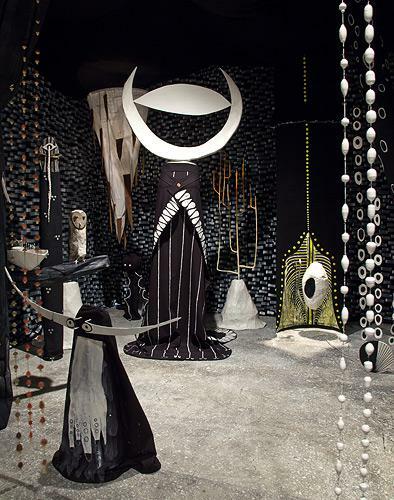 "Between the Worlds" was originally commissioned and produced by Artpace San Antonio in 2010. For more information and images, please contact Jessica Eckert, j.eckert@rosengallery.com, or Renee Reyes, r.reyes@rosengallery.com. This catalogue of Ronay’s oeuvre is produced by the Kentucky Museum of Art and Craft and the University of Louisville Hite Art Institute. Matthew Ronay: The Third Attention includes essays by Dr. John Hale, Director of the Liberal Studies Program at the University of Louisville and Matthew Drutt (M.A. Yale University) Executive Director of the Blouin Cultural Advisory Group.